For a smooth, wrinkle free, supple skin, it is very important to get a facial done at least once a month. It is not necessary to always go to a beauty salon for a facial. You can do it easily in your free time at home. A home-facial can be a morale booster, especially in those days when you are in the dumps about your looks. Arrange the following items before starting these simple steps:Cleansing milk, nourishing cream enriched with vitamin E, facial sauna or a bowl of boiling water, bowl of ice cold water, face pack according to your skin type and condition, rose water, blackhead remover or strips, cotton wool, moisturizer, head band and towel. * Make a ponytail of your hair and tie the headband to keep hair away from the face. * Put a few drops of cleansing milk on cotton wool and clean your face and neck. * Now start massaging your face with nourishing cream by mixing a few drops of water with it. The water used can be lukewarm or cold according to your preference. * Start facial massage from the forehead. 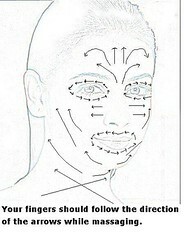 Place the 2 fingers of both the hands above your eyebrows and start massaging in upward motions. * Now come to the eye area. The area around the eyes is very delicate. Move your fingers very lightly. Place the index fingertips of both the hands beside the under corner of your eyes. Move the fingers gently around the eyes. * Similarly, massage the area near the nose. Massage on the sides of the nose and the bridge of the nose. * Now move near the lips. Move your finger on the laugh lines around the lips and on the lips, massaging with circular upwards motions. * Now the cheeks. Massage them with 4 fingers of both hands, moving them in upward direction. * Next comes the neck. Massage here smoothly. * Repeat these steps for 10 to 15 minutes. * Wipe off the cream from the face with moist cotton. * After massage the blood circulation of the face increases and the pores of the skin also open. * Steam your face. Do not take your face too close to the water or heat may cause broken veins. Steam your face for as long as you can bear it. * If you have any blackheads on the face, remove them gently with a blackhead remover or strips. *To cool and close the open pores, a cold-compress is needed. For that, take a bowl of ice cold water; add a few drops of rose water to it. Dip a towel in it, squeeze. Pat it on all the areas of the face for 5 minutes. * Now wipe the face with a wet towel. 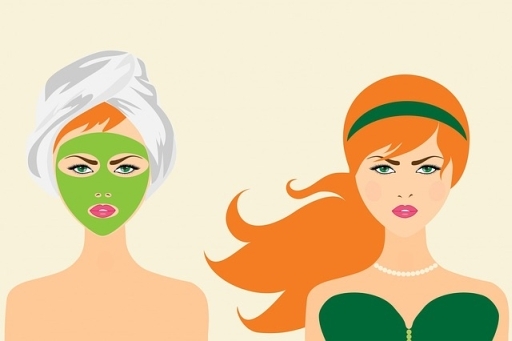 Apply a face pack according to your skin type, on the face and the neck, avoiding the eye area. Your kitchen shelves and refrigerator would provide you with a very large variety of ingredients to prepare the masks. (For various face masks you can refer Beauty masks for a glowing complexion and also some packs from Tips for a blemish free skin.) Put cotton pads dipped in rose water or cold water on your eyes. You could also massage in a little eye cream before applying the mask and then that could be working round the eyes while the mask treats the rest of your face. Relax for 20-25 minutes till the pack dries. Wash the face and apply moisturizer on face and neck. Soak some rolled oats (oatmeal) in warm water. Using a soft cloth, gently scrub your face with the meal and rinse well. Keep the water in a sealed jar in the fridge for up to two days to use as a soothing wash after removing makeup at night. You can purchase French clay at many drug stores and most health food stores now. Mix this up to a soft paste using clean water or the oat water and use as a masque. Let dry to pull impurities and clean the pores. You will need to moisturize afterward, but your skin will feel wonderful! To moisturize get a soft (but not bruised) avocado and mash to a smooth paste. Use this as a masque, warm or cold. Lie down with some good music, put cucumber slices over your eyes and relax for 30 minutes or so. Wash with warm water and gentle soap or cleanser. This works well for damaged hair too! Just make a paste, add a little olive oil to thin and work through your hair. Wrap your hair in plastic to hold in heat if you have serious drying and splits or use a towel for average hair. Allow at least a couple of hours before shampooing out and conditioning as usual. One of the best skin moisturizers is plain old lard that you buy at the grocery store. Use it (very lightly) at night and wash your face with warm water and a dab of oats in the morning. On the very dry areas you can rub a very little in for 'day wear' too. If you use make up though, it can be too 'heavy' and cause clogging of the pores. My grandmother used it all her life and when she died at 92, she still had beautiful skin! The best thing secret I learned was to add regular white sugar to my cleanser, making a paste. This is the BEST exfoliate I have ever used. It makes your skin super smooth, and you don't run the risk of having a bad reaction to a new product. Just make sure you only exfoliate twice a week. Why is it good to gently massage the face daily? As we age, our bodily processes slow down. Metabolism gets a little slower, as does tissue regeneration and cell production. Replacement of our skin cells, which happens every 28 days when we’re younger, also slows down.One of the most effective and relaxing is a good facial.